Les Roulottes, a masterpiece by Vincent van Gogh, will be exhibited at the Musée Gassendi in Digne-les-Bains from January 23 to March 29 thanks to an exceptionnal loan by the Musée d’Orsay, in the context of the cultural action “culture près de chez vous” carried out by the Ministry of Culture. It is a unique opportunity for Digne’s inhabitants to discover, in their hometown, a painting that is now inscribed in collective memory. Painted in 1888 during his stay in Arles, the painting shows the radicalism of Van Gogh’s painting which exceeds the classical conception of perspective and drawing, by a very dynamic and thick brushstroke and a color palette free of the traditional codes. 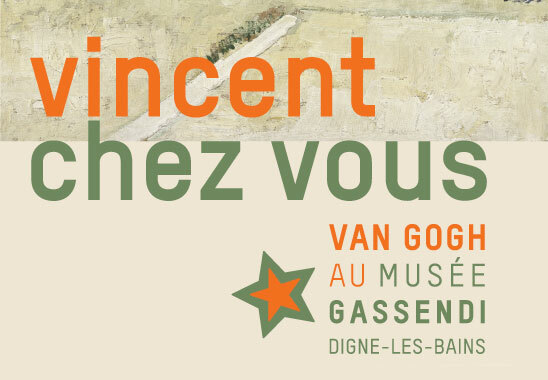 A quest for light engaged by Van Gogh in the south of France, where he paints scenes of everyday humble life, people living in the margins of society, and Travellers. Exhibited in the spacious room that showcases Provençal landscapes, the artwork will provide a way to revisit the permanent collection of the Musée Gassendi through the prism of modernity, overturning the utopian and idealized representation of rural Provence conveyed by academic painting. Truthful to its will to create a dialogue between different time periods, the museum has invited three contemporary artists whose work echos that of van Gogh : Paul-Armand Gette, Alessandro Quaranta and Knud Viktor. For almost two months, the presence of the painting « près de chez vous » in Digne-les-Bains will be accompanied by outreach actions adapted to different audiences, with a particular focus on schoolchildren and those with little exposure to culture. Discounts 4 €: Carte du CCAS de Digne-les-Bains, passeport des musées. Free children under 12, students up to 21 years old, museum professionals (ICOM card), first Sunday of every month, for special events. Guided tour 8 € single fee per person (children over 12 and adults).